One of the questions that I'm asked the most frequently both on and offline is what do I do for a skincare routine, so I thought I'd share an updated morning routine with you this week! 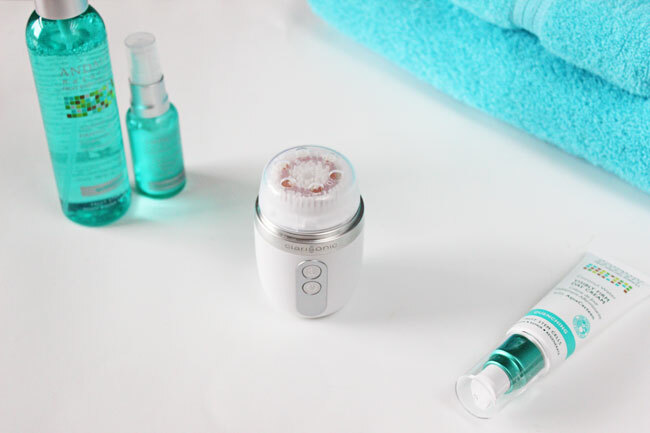 First, I cleanse my face with a gentle cleanser and my Clarisonic Mia FIT. The cleanser I've been using is 100% natural, full of skin-loving ingredients, and under $6. 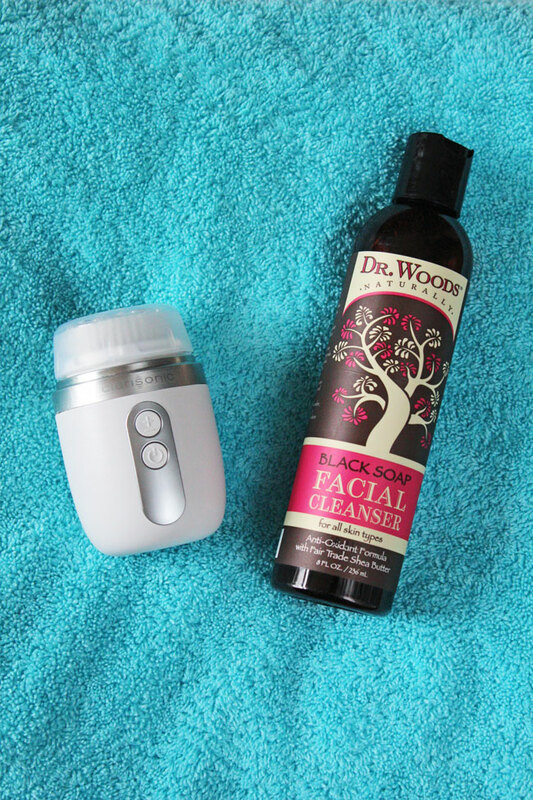 It makes my skin feel so clean in conjunction with my Clarisonic. I used to have one of the old Mia devices and it still worked, but this one is about half the size so it takes up less room and is perfect for traveling! I'm also completely in love with the new Radiance Brush Head that it came with. It's so gentle and effective. My pores have been looking smaller and my face feels so soft. I'm looking forward to cleansing my face every morning and evening instead of thinking of it as a chore. Next, I spray on the Andalou Naturals Coconut Water Firming Toner. This stuff smells like a coconut mojito. It's a little coconuty and a little minty, but not overpowering. It's so refreshing when you spray it on. Perfect for spring and summer! Then, I use the Andalou Naturals Coconut Milk Firming Serum. It's creamy and light, but really hydrating. Also, it's under $25. How amazing is that for a serum? Actually, all of their products are under $25! The last step in my routine is the Andalou Naturals Coconut Water Visibly Firm Day Cream. Just like the serum it's very light and absorbs quickly, but also quite hydrating. I'm not a huge fan of the packaging, I think my pump is broken because I can't ever get the pump to work and I have to unscrew the top and squeeze a little bit out in order to apply it. However, the cream itself is wonderful. All the Andalou stuff is non-GMO and contains such fabulous ingredients. 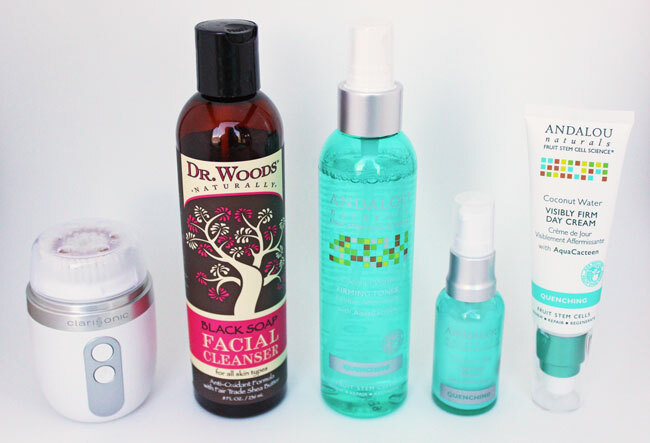 Let me know your morning skincare routine, or if you have tried any of these products down in the comments! Disclaimer: I was gifted some of the products in the post in exchange for review consideration. However, all of the opinions are my own. Andalou Naturals is one of my favorite lines too; I adore the 1000 roses scent (particularly the body lotion and toner from that line). My mom once had a dermatologist review the products she was using from Andalou and got rave reviews from the doctor too. I have yet to try the coconut water kind and I'm a coconut fanatic, so I can't wait to check it out!! I have the CC Cream from the 1000 Roses Collection and really like it! If you love coconut I'd definitely check out this line, it's so good! Oh I've never heard of this brand, but I love the smell of coconut! 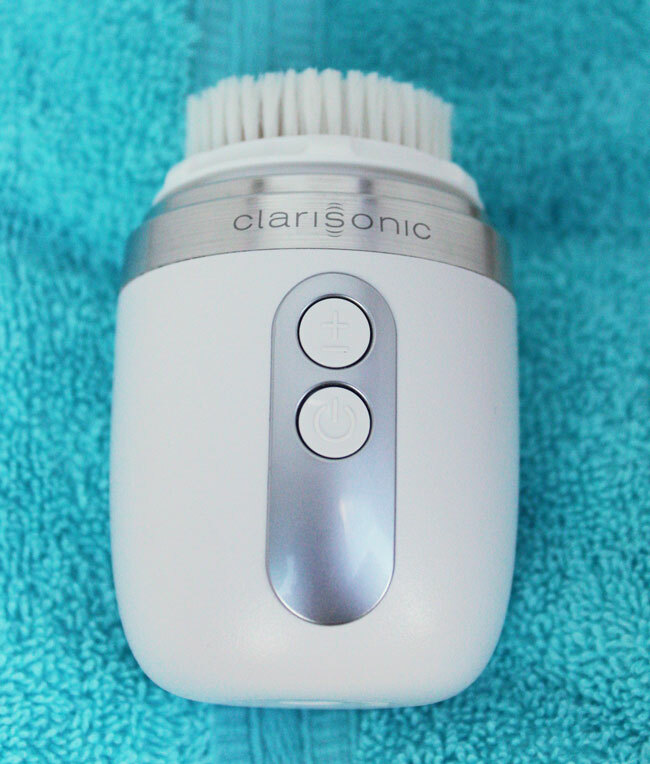 I have the Clarisonic Mia, but I like the idea that the FIT is so small. I also need to try out the radiance brush head after your review! Thanks Roxanne! It's so good! You won't be disappointed! These products looks so nice! Thanks for sharing! These products seem amazing! I have been using my First Aid Beauty products for the last year or so and I am in love. My Clarisonic brush unfortunately is broken so I really need to consider replacing it. I love how small and portable this one is so it might be a good option for me! It's definitely a good option whether you travel a lot or not! Thanks Bryn! I hope you stop by again soon! Clarisonic has been my life saver lately, so nice for making sure all my makeup comes off at the end of the day!